Landmark reversal, but still standing tall. Here’s a fascinating photo of what Kent Avenue, on the west end of Williamsburg on the East River, was like in 1983, the last year that railroading played a significant waterfront role in Williamsburg. That year its numerous former docks were still very much active, and goods were floated across the East River from points north and south to a bustling network of waterfront railroads that led to garages and yards where they were loaded onto trucks and distributed to points in Brooklyn, Queens, and across Long Island. In Queens, Long Island Rail Road tracks led to the East River waterfront in Hunters’ Point, connecting to the LIRR network of passenger rails, which occasionally carried freight. In the background on the right is a tall white building that once served as a warehouse for materials and comestibles carfloated across the river, and which still stands today. Austin, Nichols & Co. was established as a wholesale grocery business by James E. Nichols and five former associates of Fitts & Austin in 1879. It grew to become the world’s largest wholesaler of comestibles and eventually came to occupy nine buildings in lower Manhattan. 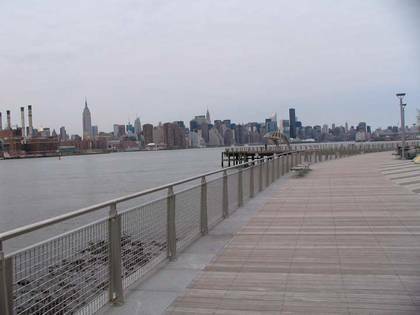 The decision was made to move to the Williamsburg, Brooklyn waterfront in the early 1900s, and the company’s financier, Horace Havemeyer, assembled a team of architectural professionals, including the pre-eminent architect Cass Gilbert (1859-1934), who had helmed the construction of the US Customs Building at Bowling Green, as well as the “Cathedral of Commerce” Woolworth tower, to construct their new headquarters. The new plant was underway in January 1914 and opened in March the following year. Unlike the Beaux Arts masterpieces Gilbert was known for, the Austin, Nichols & Co. Warehouse was a vanguard of a more streamlined style that would gradually take hold during the 20th century. The 179x440ft. plant integrated piers, railway tracks, freight elevators, conveyor belts, and pneumatic tubes. The plant processed dried fruit, coffee, cheese, olives, peanut butter, and other foodstuffs distributed under the Sunbeam Foods label. In 1934, Austin Nichols added liquor products; the building remained with the company until the late 1950s. For several decades the warehouse was home to small businesses and Williamsburg lost its riverside industry as the piers disappeared (lost to container ports in New Jersey) and the railroad tracks that served the piers and the waterside businesses went away as well. For a time in the early 2000s, the building’s fate was in question. 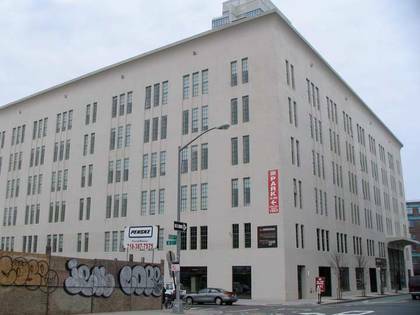 City Councilman Simcha Felder declared that “the building is a piece of trash and should be knocked down.” Nevertheless, the NYC Landmarks Preservation Commission voted to landmark the building in September 2005. The City Council, however, in a rare step, reversed the ruling in November of the same year and overrode Mayor Michael Bloomberg’s veto. Soon after the building was sold, its new owners qualified for the Federal Historic Preservation Tax Incentive Program, which enabled its revival. The Austin, Nichols & Co. Warehouse has been completely restored and refurbished as a private apartment building, with a waterside walkway open to the public.